Exclusive: Voters approved $20 billion to build LA schools. As last one opens, the ultimate insider explains why they were so desperately needed. 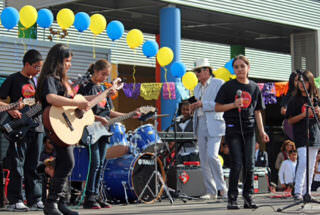 This week, a significant milestone is being achieved for the students of LAUSD that deserves to be celebrated. The final school — Bell High School — is coming off the year-round calendar, meaning that every school in LAUSD will now be on the traditional nine-month calendar. Combined with the end of mandatory busing, this means every student can now attend school in his or her own neighborhood, receiving the proper amount of instruction every year. It may sound basic, and it’s a little difficult to explain just how we got here and why it’s so important, but the taxpayers of this city agreed to spend more than $20 billion to do it, resulting in the largest public infrastructure investment in U.S. history. The fact that the goal has finally been achieved is worth talking about. It’s a story worth telling. 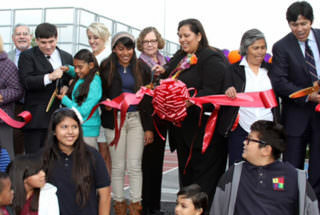 I’ll never forget the day the first new comprehensive high school opened in Los Angeles in over 35 years. It was 2005, and it was on the site of a former Santee Dairy milk processing facility, hence its name to this day: the Santee Educational Complex. So the district grew by more than 100,000 students, yet did not build a single new comprehensive high school during that time — and barely built new schools of any variety. So what did the district do to accommodate all those new students? Two major things: First, they started busing students out of neighborhoods where there was no room in the local school to neighborhoods that had more space. This isn’t the “integration” busing that was so controversial in the 1970s. This was busing for no other reason than the fact that the local school couldn’t hold them. And Los Angeles isn’t a small place. So think about the implications of that. Children would have to get up often an hour or even two hours earlier. They would walk or be driven to their local school, except they wouldn’t walk in the front doors. They would then get on a bus and ride usually a very long way to a school in a different neighborhood with kids who didn’t live near them. And they were the “other” kids, usually from the “worse” part of town. They couldn’t participate in after-school activities. They couldn’t hang out with their friends after school. Their parents would have to drive that same hour or two for back-to-school night or to visit their child’s school. At its height, 16,000 kids did this every single day. It’s just a really tough situation for both students and parents — and does a lot to negatively impact their education. The second thing they did is institute a “year-round,” or “multi-track,” calendar. The way it works is that only two-thirds of a school’s students attend at any one time, while the other third is “off track.” There is no traditional summer, just a series of shorter breaks throughout the year. The term “year-round” is misleading because it sounds like more school. But the year-round calendar is actually 17 fewer instructional days per year — 163 versus 180. In order to meet state-mandated levels of instruction, the school day would be extended because the state requires a certain number of minutes per year. But think about it — are you more productive for a few extra minutes at the end of a long day, or do you get more done when you start fresh? So a child who attended a multi-track school from kindergarten through 12th-grade — which many did — would get the equivalent of one less year of instruction during their schooling. In addition, for kids on certain tracks, the matriculation to the next grade would happen over the course of a weekend. So a kid could end 10th-grade on a Friday and start 11th-grade on Monday. And finally, especially at the high school level where extracurricular activities are so important, it was very difficult to have students from different tracks consistently work on or participate in anything together since some students were constantly cycling in and out. In short, while people adapted to it and in some cases even started to prefer it, this calendar was never instituted to improve instruction. It was only meant to fit more kids into the same school. Romer had been a three-term governor of Colorado, head of the National Governors Association, chair of the Democratic National Committee, and chair of the Democratic National Convention in Los Angeles. One of his signature policy issues had always been education. Bill Clinton called Romer his “partner in education reform” in his post-presidential memoir. Knowing his passion, during the run-up to the DNC Convention, some civic leaders approached him about whether he would consider being superintendent of LAUSD, where a new reform-minded board was looking for a change agent. In a move few could have predicted, this then-71-year-old who had been to the pinnacle of U.S. politics — for instance, Romer had hosted G-8 summits at his house, and Al Gore had recommended him to Clinton for VP before being chosen himself — took the job, starting in late 2000. 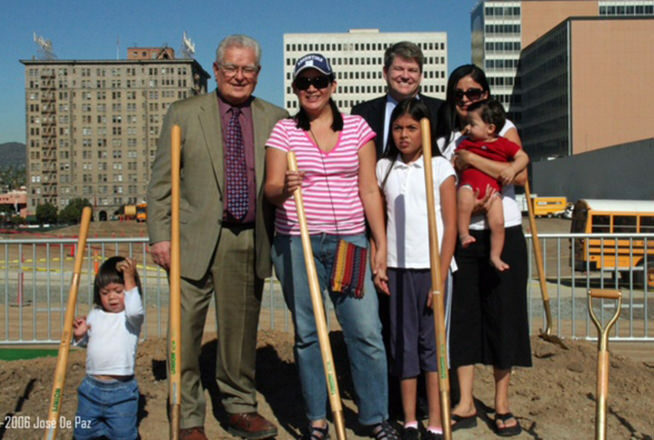 When Romer started, building schools was the last thing on his mind. He had chaired the National Goals Panel on Education when he was governor. He had championed wide-ranging curriculum reforms. He was passionate about the importance of reading and literacy. So when he came to Los Angeles, he was shocked by what he saw. Overcrowded classrooms. Kids on buses two hours each way to school. This crazy multi-track calendar. How could he expect teachers to teach and students to learn if they literally didn’t have the space to learn in? So Romer used the one resource at his disposal to solve the problem that nobody else had tried: sheer will. How else to explain why the district hadn’t built these schools earlier? LA had passed a bond measure in 1997, but that was mostly to repair existing schools. Nobody had ever stood up and said, “This is unacceptable,” or had the courage to ask LA voters to make a significant investment in new schools. Especially when it wasn’t particularly simple to explain why they were needed. On top of that, building new schools wasn’t going to be easy. Look around. LA doesn’t exactly have a whole bunch of empty, clean plots of land waiting for a school to be built on them. Which meant that school board members were going to have to vote to exercise eminent domain, forcing people to sell houses and businesses so that schools could be built where they were needed. Not exactly the most popular thing for a politician to do — the City of LA hadn’t exercised eminent domain in any meaningful way in years. And this investment would not be evenly distributed throughout the district. In fact, the voters in wealthier parts would pay the lion’s share of these new taxes, while these shiny new schools would get built in the needier areas. So, again, certain board members would be asked to vote on eminent domain, and to ask voters for new taxes, and yet not be able to show their own constituents what they would be getting for their money. 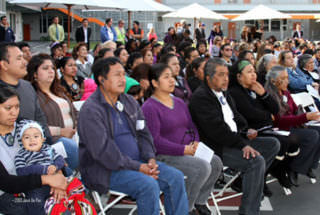 Finally, if that wasn’t enough, when Romer’s first chance to put a bond on the ballot came up in 2002, the San Fernando Valley had garnered enough signatures to run a ballot measure looking to secede from the City of Los Angeles. And polls showed that, while secession wouldn’t have applied to LAUSD as a separate governmental entity, many voters thought it did, and that this issue drove voters to the polls. Surely, these voters who were, by and large, older and more conservative wouldn’t vote for new taxes and new schools when they didn’t even want to be part of the district in the first place. Yet Romer was undeterred. We either cared about kids or we didn’t, he said, and he was ready to put that question in front of Los Angeles. So we put the largest local school bond that had ever been proposed on the November 2002 ballot. I had to put together a bond package that met the district’s needs, that could get seven votes on the board (because nobody wants a divided board when it comes to putting taxes on the ballot), that passed the smell test with activists and other community stakeholders, and that still had a fighting chance to get approved by voters. No easy feat, but we got it done, and the board voted unanimously to put Measure K on the ballot. Conventional wisdom was that we had an uphill battle, and that was charitable. The previous 1997 bond measure had come under fire for being under-budgeted and under-delivering on its promises, so we had to include money in this bond to make up for those gaps. We talked a lot about overcrowding and busing and the ills of the multi-track calendar, but the truth was that we could never get enough money to build all the schools we needed with one bond measure, so we weren’t going to be even close to actually solving the problem with this bond. We had money for repairs, but much of that was for basic infrastructure that, while critically needed, was often not visible or compelling — HVAC systems, fire alarms, asbestos removal. And politically, Valley secession was on the ballot, so a big chunk of motivated voters would be hostile to anything LAUSD. Voters statewide had recently approved lowering the approval threshold for local school bonds to 55 percent from the previous two-thirds threshold, so maybe, just maybe, we could squeak by. But a whole lot of people were very skeptical and continually told us so. I can’t count the times somebody said, “Why don’t you just wait?” For us, students had already waited long enough. Well, turns out that people weren’t giving Los Angeles voters enough credit. Measure K passed with 68 percent of the vote. We cleared the two-thirds hurdle, even though we didn’t need to (especially rewarding in the face of all the “taxpayer advocacy” groups who howled that we were “cheating” by availing ourselves of the lower threshold). That first campaign was a ton of work. But March 2004 was the next ballot on which we could legally run another bond given LAUSD’s unique boundaries, meaning we would have to start planning just a few months after passing the first bond if we were going to put another one on the ballot. Some advised Romer that we couldn’t go to voters again so soon, but the job wasn’t done. Kids would still be on buses, still be on multi-track calendars, still be in overcrowded classrooms. So off we went, with yet another, even larger, bond measure. Gov. Arnold Schwarzenegger had put a deficit-reduction measure on the ballot that topped $15 billion and didn’t do anything but help balance the state’s budget. It was a “hold your nose and vote for it” measure, and countless people told us there was no way voters would approve billions more for schools after having to punch their ticket for this monstrous statewide measure. But, again, people underestimated Los Angeles voters, and we passed — though this time with “only” 63 percent. An important side note here is that, for technical reasons, the only time the district can put a bond on the ballot that qualifies for the 55 percent threshold is during a statewide or countywide election. So Romer was hesitant to let a “qualifying” election go by given the dearth of opportunities. But in that politically toxic environment, most everyone in the district, including me, advised Romer against it. We had gone to the voters twice in 16 months, and now barely another year had gone by. It was just too much. In retrospect, this was a moment. In education, everybody says — and generally means — that they are in it to help kids, to make sure students have the best shot at a productive and rewarding future. But actually turning those words into actions is where the rubber meets the road — and is what separates rhetoric from reality. That’s where education is hard. And our reality was that even with two very successful and huge bond campaigns, we still didn’t have enough. Thirty-plus years of inaction meant we had to build anywhere from 120 to 150 schools, depending on population growth and birth rates (the final number ended up being 131), if we wanted to get every kid off the bus and every kid back onto the traditional calendar. Not most kids. Not almost every kid. Every kid. Romer saw that. And, more importantly, he had the will and the courage to act on it. And so off we went, running — yet again — the largest local school bond in U.S. history. We called this one Measure Y because not only did it stand for “yes,” but we wanted to signal that it would finish the job. (I don’t remember if Z was taken or we just thought it sounded weird.) And the voters delivered yet again — this time, putting us just past that magic two-thirds threshold that further validated their commitment to serving kids. And with that, finally, we knew we could deliver on the promise. Another bond, Measure Q, was passed by a subsequent regime in 2008 that was much larger, and focused almost exclusively on the district’s massive repair needs, which is just as admirable and just as necessary. But mid-2002 to late 2005 feels today like one long campaign where we traveled to every community in all 26 cities that LAUSD serves, from Chatsworth to San Pedro, Venice to South Gate, educating people about not just “overcrowding” but what that really means to parents and students, and the difficulties that mandatory busing and the multi-track calendar had brought to trying to provide high-quality instruction. It was “back to basics” before Mayor Garcetti popularized the term. Do new buildings do anything on their own to make for better schools? Of course not. But we know it’s a heck of a lot harder to teach kids well when they’ve had to sit for two hours on a bus to get to school, or when they are cycling in and out of various tracks, getting fewer days of instruction, or where you have to pack classrooms to the gills. We couldn’t hope to make the progress we were committed to without something as basic as the space to do it in. 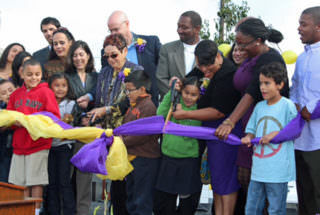 And new schools do send important signals about our commitment to communities, especially low-income communities. Standing in front of a brand new school on the very first day it opens is an experience like no other. The excitement, the wonder, the curiosity, and even the surprise on the faces of these students and parents are priceless. Now think about how that little boy is going to react when his teacher asks him to pay a little more attention, to do his reading, to learn something new. He will have so much more incentive to further his education because we believed in him, and we showed him that. We did something about it. The specifics of how these schools got built is another story worth telling entirely. The eminent domain struggles. The fights with developers and others who wanted to do something else with the land. The outreach to impacted communities. Relocating thousands of families. And all of this happened with very little controversy and no major scandals. While spending billions of public dollars. We were building the equivalent of the entire San Diego school system on top of the Los Angeles school system, while that system continued to function. It was the nation’s largest public works project, and how it actually happened is fascinating and offers a whole other series of lessons — and good stories. It is the fulfillment of a promise made over a decade ago. In ways both large and small, both seen and unseen. A commitment inspired by a strong-willed and committed superintendent, supported by several different iterations of LAUSD board members, endorsed and helped along by a cadre of civic leaders, passed by Los Angeles voters, and carried out by some of the most committed, ethical, trustworthy public servants I’ve ever known (most of whom had been Navy Seabees — part of that next chapter). 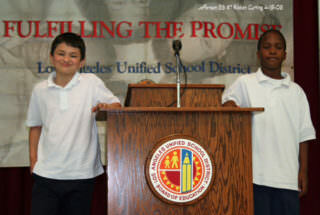 It was a promise made to every LAUSD student. And this week, we delivered on that promise to the very last ones. • For a list of all the schools in the building program, click here. 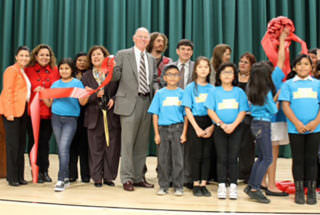 • More from LA School Report: Maywood school is the last to open in massive building project. But dwindling enrollment makes today’s LAUSD a very different district. Glenn Gritzner is a partner at Mercury, a national public affairs firm, in the Los Angeles office. Disclosure: The 74, the parent of LA School Report, works with the New York office of Mercury.